I had wanted to do a drawing a while back and I kept hitting an artist block. I asked a friend of mine for some advise and he told me to try doing a boxer since I had never done one before. Never one to shy away from a challenge I jumped on this drawing. It has taken a little longer than I had wanted, but it is finally finished. 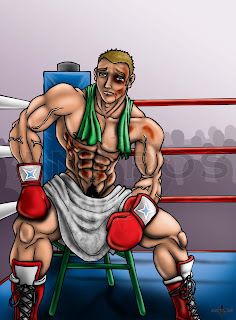 I tried to put the bruises in the places that a boxer would get hit, but I might have missed some. So take it with a suspense of disbelief if my bruise areas are way off. You will find both a censored and uncensored version here. I did a censored version so that I could post to my Deviant Art page as well as being able to do live drawing vids on Livestream without having to worry about being banned. Cool beat up boxer bro! He rocks. Nice job on that chest and sculpted abs! I would love to get into the ring with him! :P So would Joey! XD Ha ha ha..